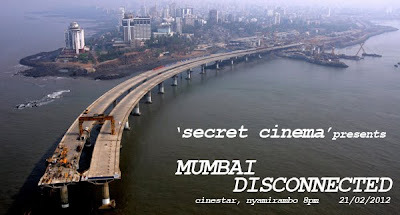 Starting with 'Cairo Garbage' ,which looked at systemic disparties between the cities waste management plan and its increasing population, I will now screen the second , of the four movies, titled 'Mumbai Disconnected. This will be shown on 21st February at 8pm , at CINESTAR cinema in Nyamirambo. (Running time is 58 minutes). 'Like a city on steroids, Mumbai is rapidly becoming one of the world's biggest megacities. But it's all happening on a narrow peninsula with an infrastructure on the verge of complete collapse. Every day, 10-12 people die from falling off the overcrowded public trains. On the roads, cars come to a stand-still in serial traffic jams. To make matters worse, the Nano, India's new popular and affordable mini car, has just been launched. Through three interwoven human stories, we meet the people at the frontline of Mumbai's infrastructural battle. One thing is certain: urban planning is not easy in the world's largest democracy!' Danish Film Institute. Entry is now 1500 RWF per person to subsidise free entry for the KIST Students. Your support is enabling these students exposure to resources not readily available at KIST and we thank you for your patronage.